In this cool and beautiful Manchester evening, friends, representatives of Chinese compatriots, Chinese enterprises, and Chinese students from different corners of our Consular District join us celebrating the 64th National Day of the People's Republic of China, and share the joys and prides for the achievements of 1.3bn Chinese people, and our hopes for realizing the beautiful Chinese Dream. First of all, on behalf of the Chinese Consulate General, allow me to express my warm welcome to all of you. In the past 64 years, led by the Communist Party of China, the Chinese people with different ethnicities overcame countless hardships and made marked progress in various fields. China is marching steadily forwards to realizing the beautiful Chinese dream of state greatness, national rejuvenation, and people's happiness. President Xi Jinping points out that, "today, we are much closer than any time before to realize the great goal of rejuvenating the Chinese nation, more confident and more capable than any time before to realize this goal." The Chinese dream is an inspiring flag for the advancement of current China. The scenario is attractive. We are confident that we will achieve it. --The Chinese dream is the dream of peace. Since modern times, China had suffered hugely from foreign invasions and bully. We fully understand that without peace, no dream can come true, no matter how beautiful it is. --The Chinese dream is the dream of development. We develop through incessant reforms. The Chinese dream is not for surpassing or replacing, but for the happiness of the Chinese people, and for the common development of the world as well. --The Chinese dream is the dream of opening up. The Chinese civilization itself came into being by studying from other cultures. There is no way to realize our dreams other than to achieve development through opening up. --The Chinese dream is the dream of cooperation. Where there is cooperation, there is win-win situation. Old thoughts like Cold War mentality and zero-sum game are no longer suitable for this world. --The Chinese dream is the dream of accommodation. All peoples have dreams rooted in their own history and soil. We believe that channels exist between different people's dreams. We all can learn from each other and accommodate each other. Under the guidance of the Chinese dreams, China again secured new achievements in many fields. Shortly after it took office in March, the new Chinese government made clear its policy was to sustain economic growth, improve people's wellbeing and promote social equity. The government takes a holistic approach in pursuing steady growth, structural readjustment and further reform. In the first half of this year, China's economy saw a growth of 7.6% after it grew 7.6% last year. The speed far exceeds that of other major economies. 7.25 million new jobs were introduced. In 2012, China invested USD 87.8bn in foreign markets, with a 17.8% annual increase, and became the third largest foreign investor in the world. At present, China is speeding ahead with industrial upgrading, urbanization, IT development, and agricultural modernization. It is estimated that over the next decade more than 100m are set to be absorbed into cities. In 5 years, China will import USD 10tn commodities, and invest USD 500bn in foreign markets. 400m Chinese tourists will travel abroad. Recently, some observers saw the declining of the growth rate of the Chinese economy which was double digits several years ago. On that, Premier Li Keqiang specially points out in his article China Will Stay The Course On Sustainable Growth published in Financial Times 9 Sept.2013 that, the Chinese economy will maintain its sustained and healthy growth and China will stay on the path of reform and opening up. Premier Li says that the moderation of economic growth from 9.3% in 2011 to 7.6% in 2012, and then to 7.5% this year is the result of both natural economics and our readjustment initiatives. The new season of the Chinese economic miracle, one of better quality and higher efficiency, is unveiled, and more exciting stories are to come. The sound development of the Chinese economy will bring about meaningful and auspicious effects on other major economies, including the UK. From last year up till now, the UK absorbed more than USD 12bn Chinese investment. Our central banks signed a currency swap agreement worth 20bn pounds. Last year, 150,000 Chinese tourists travelled to the UK to enjoy the beautiful nature and abundant culture. Many of them watched football games in Manchester, and visited the Chatsworth House. I was told by the Chief Executive of Manchester Airport Mr Charlie Cornish that Chinese travelers are the largest consumer group in the MAG shops. Such information is exciting. The Manchester China Forum launched this year will undoubtedly boost exchanges and cooperation between Manchester and China. Here I would like to tell you that, with lots of efforts taken, China-UK relations returned to the normal track after going through some difficulties, which will definitely provide reliable insurance for the mutually beneficial cooperation between our two countries. Chinese enterprises are "going-out", while the UK has plenty of edges in innovation, creativity, culture industry, financial service, etc., which attracts more and more Chinese Companies to settle down here. We also see that there are many opportunities in the UK market in fields like energy and infrastructure. For example, HS2 is a hot topic here in the UK. China has the largest and most advanced Hi-speed railway system. We believe we two sides can find good ground for cooperation in this aspect. 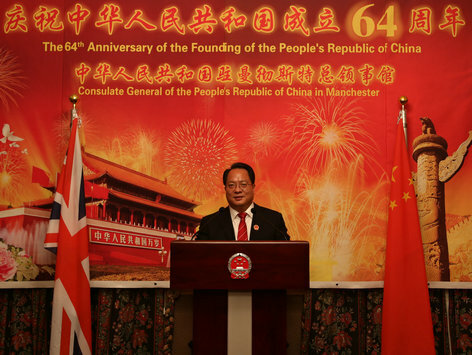 It is our important duty as Consulate General of China in Manchester to promote the cooperative exchanges between our Consular District and China, and to strengthen the friendly feelings between people in our Consular District and people in China. Both China and UK are great countries in education. We both have the tradition of respecting knowledge and stressing the importance of education. The world-class universities and research centers in our Consular District draws more and more Chinese students for further studies. Two years ago when I first arrived here, Dame Nancy Rothwell, President and Vice-Chancellor of the University of Manchester told me that there were about 2500 Chinese students and scholars in the University. Recently, I heard that the figure has risen to nearly 2800. Many other universities in our Consular District also saw similar increases. This is the result of China's opening up and social advancement, but also the result of active working of related institutions, especially the universities. We would like to see more Chinese students come here for study. One the one hand, they learn refined knowledge so that they are better capable of taking future challenges; on the other hand, through interacting with the locals, they contribute their own part to the friendship between our two peoples. We are happy to see our Consular District pay more and more attention to Chinese culture and language. Since last year, Confucius Institutes were launched in the University of Leeds, the University of Newcastle, and Edge Hill University. Now there are 8 Confucius Institutes in our Consular District altogether. I also heard that many primary and middle schools opened Chinese language class. We thank the councils, schools and other sectors which provide support to Chinese teaching in our Consular District. As always, the Chinese Consulate General will continue its support to the Chinese teaching in our Consular District. The strength of China provides solid back-up for the work and life of overseas Chinese. The development of China cannot be achieved without the care and support of overseas Chinese. In the past year, the Chinese communities here cared about China, took part in the construction and development of China, and made your contributions to China's advancement in different areas. Here, on behalf of the Chinese Consulate General, I'd like to express my sincere thanks to all of you. My work in the last two years gives me the deep impression that the Chinese communities in our Consular District are united and harmonious, and interacts with each other frequently. The Chinese communities spare no efforts in disseminating the Chinese culture. Every time when it is traditional Chinese festival or the National Day, large-scale and joyous celebrations are carried out in many places. Manchester included, many cities and boroughs make it an important local cultural event of the Spring Festival celebrations. During the last Dragon Boat Festival, the dragon boat race organized by Manchester Xinhua Association saw 20 or so teams in the competition, and drew the attention of nearly 10,000 local people. It is said that the race was most likely the largest Chinese Dragon Boat race across the whole Europe. Here, I'd like to thank the organizers for your efforts in inheriting and relaying the Chinese culture. I shall also thank other sectors like the Salford City Council that provided support for the event. I hope the Chinese communities, with the inspiration of rowing the same boat, go on with disseminating Chinese culture, and make contribution to the cultural variety of your cities. Just like what President Xi Jinping said, "to realize the great national rejuvenation is the greatest dream of the Chinese nations since modern times. This dream composes the wishes of the Chinese people for generations. It is the common dream of every Chinese." Looking backwards, we are proud of what we have achieved; looking forwards, we are excited of what we will make. We are very glad that on our road to make our beautiful dreams come true, we have the support and assistance of the people in our Consular District. We are very glad that we develop in par with our Consular District while we Chinese build own beautiful home. Let's wish for the prosperity of China! Wish for the deepening of the friendly relations between China and UK! Wish for more fruitful cooperation between our Consular District and China!